Making a basketball layup in the heat of competition is tough for young players! Learn how to shoot a basketball layup at game speed with these simple basketball tips. 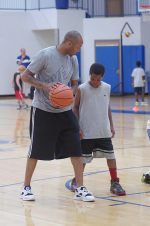 Players first need to learn the basic footwork for the layup. There are other basic shots every player needs to learn how to shoot. As a general rule, when you dribble on the right side of the court, you should use your right hand. When you dribble on the left side, use your left hand. Usually, your defender is between you and the basket, so you want to use your outside hand to keep the ball out of her reach. 3. Plant the foot opposite your shooting hand and push upward off the ground when you hop. You need to plant your inside foot and transfer your motion immediately from going forward to going straight up. If your body continues moving forward, you will likely end up too far under the basket. You should take off somewhere near the block. If you get too far under, you won't be able to lay the ball up off the backboard, and it will probably hit underneath the rim. This will help protect the ball from the defender. As you extend your arm, your right hand will lift it up past your ear and into full arm extension. The non-shooting hand should be on the side of the ball. When you shoot a lay-up on the right side of the court, use your right hand. When you shoot on the left side, use your left hand. Usually, your defender is between you and the basket, so if you shoot with your outside hand, you will be able to protect your shot with your non-shooting hand. If you shoot with your inside hand, your defender will have no trouble blocking your shot. Release the ball off your fingertips with a flex of the wrist. 12. See the ball go in the basket after taking your shot. 13. Always use the backboard unless you are driving down the middle or the baseline. It's easy with all the excitement and adrenaline flowing to shoot the ball too hard so that it smacks off the backboard.